Are you looking for a great photo gift for a yourself, a family member or friend? Right now Canvas People is having an 80% off holiday sale which makes the 8×10 only $10!! First let me tell you, these canvas’s are amazing and with a great picture can be displayed in any area of the home. These are not some cheap flimsy canvas prints. My photo is mounted on a sturdy wood frame over an inch thick. Making mine was quick and easy and it arrived in just a few days. The image wraps all the way around the frame so no unsightly wood showing on the sides. You can choose to frame your canvas for $24.95, but it looks perfect to me without the frame. I used Canvas People to place my order here and as you can tell, I am very happy with their quality and service. Right now you can save 80% off all size canvas prints and get an 8×10 for as low as $10 ($24.99 with shipping). I have the 16×20 of my children playing at the park hangs in my hallway and I love it. The image quality looks great and the canvas itself is huge. I highly recommend ordering a canvas photo for moms and grandmas. We never get tired of looking at pictures of the children we love plus this is a gift that keeps giving. I get a good feeling inside every time I walk down to hall past this photo. To learn more about Canvas People, check them out here. 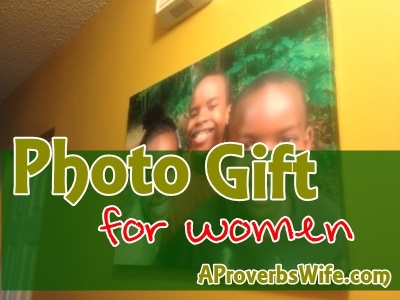 To see the other 59 gifts I recommend for Christian moms including 20 books, go here.